Bombardier have officially launched a new aircraft today, the CRJ550. Based on the CRJ700, it’s a 50 seat variant which will have the inimitable services of United Airlines as the launch customer. Although from the outside it looks just like a CRJ700, on the inside it’s very different. Bombardier have called it ‘the first triple class 50 seat aircraft in the world’. It’s received a new certification, which indeed makes it a new plane, technically at least. The CRJ regional jet program is the last remaining commercial aviation project left at Bombardier, after they handed their CSeries (now the A220) to Airbus last year. 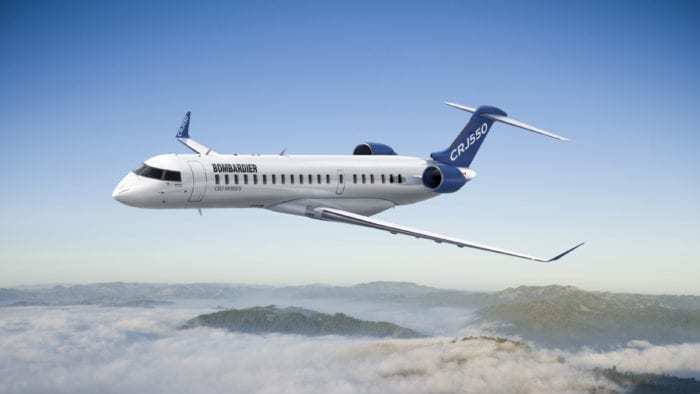 What can we expect from the Bombardier CRJ550? United Airlines are going for a really premium heavy product on their Bombardier CRJ550s. In total, there will be 10 first class seats, 20 economy plus seats with extra legroom and just 20 regular economy seats. 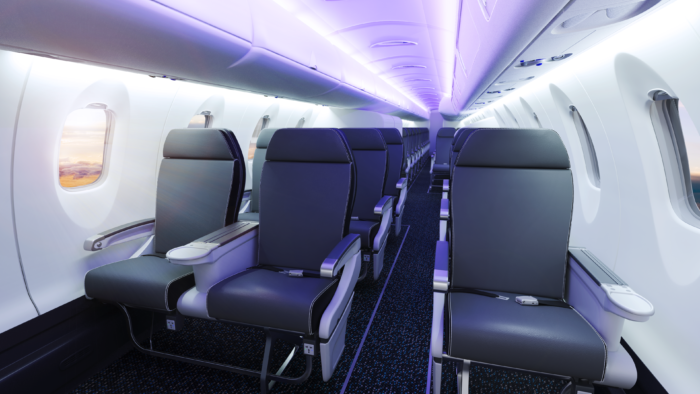 Overall, this aircraft will have more legroom than any other 50 seat aircraft in operation. It will also have a self-service snack bar and additional closets for storing carry on baggage. 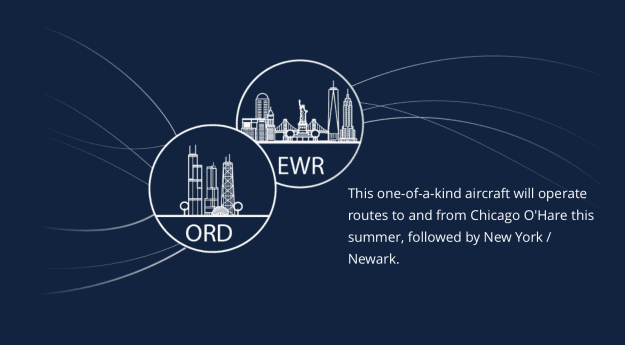 Initially due to be based in Chicago O’Hare and Newark. Although routes are not disclosed yet, United have said they will deploy the jets on routes of less than 900 miles with a high premium demand. It’s thought that the new aircraft will, eventually, replace United Airlines’ current 50 seater, the CRJ200s. Why does United Airlines want the CRJ550? Earlier today we discussed how United are focusing more and more on a premium class product. Simple Flying believe they are carving a niche in the premium passenger market, which makes much more sense than trying to compete on price with the many LCCs. The CRJ550 certainly fits in this bracket, with 20% of the aircraft seating allocated to first class, and just 40% as basic economy. 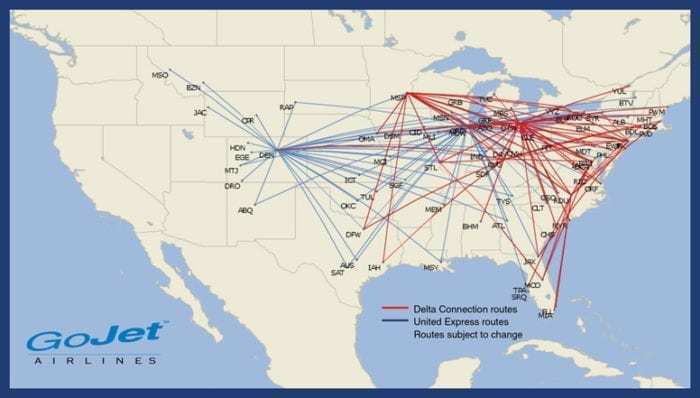 Using Bentonville, Arkansas, home to Walmart’s HQ, as an example, he explained that a CRJ550 could add capacity for premium passengers connecting to their network. “We’ll attract more premium passengers to our network as a result,” he said. However, there’s another reason that the 50-seater variant is such a good fit for United, and that’s to do with a contract they have with pilots unions, known as the scope clause. Designed to protect union jobs at major airlines, the scope clause limits the size and / or number of aircraft that can be contracted out to regional airlines. United Airlines’ pilot scope clause states that only 225 aircraft between 51-76 seats can be contracted, with no more than 153 76-seater aircraft included in this number. 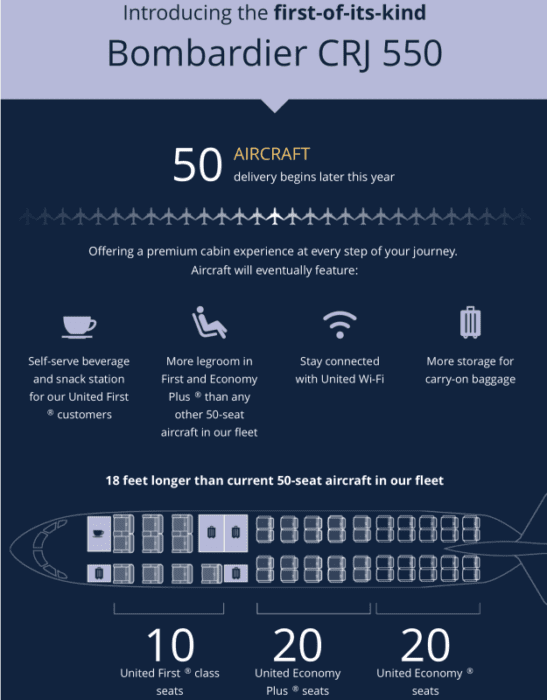 Conversely, they are allowed to contract up to 90% of their single aisle fleet as long as they are 50 seats or less. And outsource them they will, with GoJet selected to fly all of the CRJ550 aircraft on behalf of United Airlines. Headquartered in St. Louis, GoJet are a leading regional airline operating as both United Express and Delta Connection. Their agreement to fly the CRJ550s has been confirmed for a 10 year period. They are expected to enter into service by the summer, with 25 in service by the end of the year and all 50 by summer 2020.